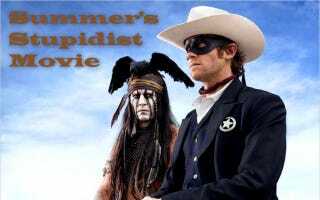 In a summer filled with painfully stupid, joyless blockbusters, Disney's The Lone Ranger offers a very special brand of insultingly terrible boring nonsense. But is it the year's stupidest movie, or just in the Top 10? At least the western's "accessories collection is made by a Lakota Sioux leatherworker named Gabriel GoodBuffalo." "A Pirates of the Caribbean film where Captain Jack has a bird on his head," writes io9's Charlie Jane Anders. "Everything is ugly and uncomfortable," says Rich Juzwiak of Gawker.